GDR citizens showing Western Germany travel permits on 19 August 1989, in Sopron. On 19 August 1989, just outside the small Hungarian city of Sopron, in a meadow only metres from the barbed wire and armed guards at the border with Austria, civil society representatives from east and west held a “pan-European picnic”, a day in the country that aimed to put an end, through small symbolic steps, to cold war division. In a small though surprising gesture of openness, this “déjeuner sur l’herbe” was authorised by the communist government. Nobody expected, however, that thousands of people, many of them East German citizens on holiday in their “brother nation”, would decide to join the gathering and head towards the line of demarcation, intent on peacefully breaking through the iron curtain. Heedless of all risk to their safety, they decided to cross the border on foot. Taken by surprise, the communist regime’s police didn’t fire a shot, giving rise to a popular movement that, a few months later, brought down the Berlin Wall. It marked the beginning of Europe’s reunification, brought to fruition in the following years with the construction of a common democratic space that would include (albeit controversially) a large number of countries that, after 1945, had been abandoned to Soviet oppression. Last August, I made my way along the former iron curtain from Slovenia to Germany, passing through abandoned checkpoints. Portions of the wall were still intact, and old military posts testified to how quickly history can get out of hand. I thought of that picnic 29 years ago – how that simple gathering started a process that changed the course of history. I also thought of how today, as dark clouds gather once more above Europe, the time has come for all citizens of good will to mobilise. To gather as they did at Sopron in the summer of 1989, and resist any return to division, xenophobia, exclusion, discrimination and barriers. In short, to prevent any return to a past of pain and oppression. Democracy itself and the European Union – the most formidable political construction in modern history – are today under attack. Donald Trump’s US and Vladimir Putin’s Russia are united in their intention to dismantle the political union, and work daily to that end, with the support of local extremist political parties. The time has come for sincere European democrats to react to this deadly threat. It is time to wake up and resist the extremist forces that mask their intentions under assurances that they do not want to resort to violence and the destruction of the constitutional and democratic equilibrium. In reality, however, wherever they have taken power, these forces call into question liberal principles and stigmatise minorities, the opposition and outsiders. They antagonise civil society organisations and dissident voices, reignite old ethno-nationalisms, fuel fake news and foment hatred in their constant search for scapegoats. Back in the 1930s, extremist parties systematically resorted to terror and violence. Now, in the early 21st century, they rely on disinformation, defamation and intimidation. But beware of underestimating the tragic endgame of these policies. Who would have imagined even a few years ago the demonisation of non-governmental organisations, the violent rejection and murder of refugees, the persecution of foreigners, the conspicuous increase in xenophobic acts or, as seen recently in the US, the separation, segregation and incarceration of children, guilty only of having tried to cross the border with Mexico? All this while dictatorship, illiberal democracy or bloody conflict run wild in nearly all the countries surrounding the European Union. Peaceful coexistence is under serious threat, as much as the European Union which embodies it. The crisis we face is no longer one of legitimacy and the evident dysfunctioning of Brussels, as illustrated by the recent migration challenge. It is the very existence of the postwar democratic and social pact that is, little by little, being called into question. Everywhere, democratic and progressive forces are distressed by the re-emergence of ghosts thought to be confined to the past. How to combat the tendencies and assertions of parties that exploit the confusion of populations faced with economic crisis, the disruption of globalisation and the loss of traditional reference points? A democratic uprising should inevitably begin with the convergence of forces, associations, groups and individual citizens who were until now divided by misunderstandings, old grievances, different sensitivities. Now is the time for genuine democrats to find their feet, and unite against a common nemesis that could displace them and bury liberal democracy for good. We cannot remain unarmed against projects such as that planned by the far-right American Steve Bannon to build an international alliance of European sovereignists. As in August 1989, the time has come to call on citizens to organise, gather together, and change the course of history. “Where there is danger, there also rises that which saves,” wrote the poet Friedrich Hölderlin. All of us who are conscious of the dangers currently threatening Europe, Italy especially, and who feel we are facing a turning point in our lives and those of our children, cannot just wait for this threat to fade away. All those who believe that the old national reference points are not sufficient to address the new geopolitical, economic, social, migratory, technological, cultural and environmental challenges, who believe in a more united Europe, all those convinced that the United States of Europe is the only serious and concrete hope for the reaffirmation of the spirit of liberty, justice, solidarity and fraternity, should now make their voices, their cries, their determination, heard. This is why a few months ago I founded EuropaNow!, a civil society organisation aimed at fostering a sense of European patriotism and promoting a United States of Europe. It is up to all democratic Europeans, especially the young people of the Erasmus generation, to show that they still hear the echo of liberty from Sopron, that they’re ready to take to their feet for a united and fraternal Europe. To that end, on 6 October, EuropaNow! 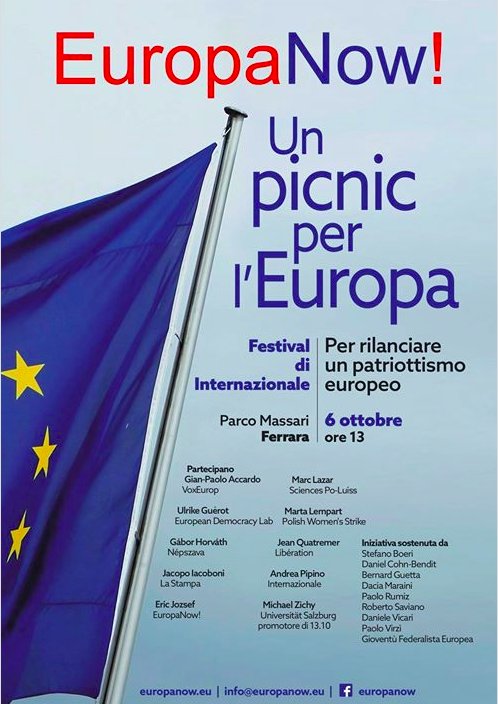 will hold a pan-European picnic, in parco Massari, in Ferrara, Italy, during the Italian weekly Internazionale's annual festival. Ulrike Guérot, Marc Lazar, Marta Lempart, Jean Quatremer, Michael Zichy, Guillaume Duval, Catherine André, Gian-Paolo Accardo, Andrea Pipino and many more will be attending. Join us!